“I was seated on the steps when the madam, a teacher, approached me with needles, and forced me to lie down. Her husband, a police officer, joined her. He covered my face and held my hands tightly, allowing the wife to do the needful”. This was how V.R. Letchumi, the Sri Lankan housemaid who had needles driven into her body, described her painful ordeal in Kuwait, while recovering at the Kurunegala Teaching hospital, where she underwent surgery to remove the needles which the madam of the house had pierced into her body, like in an acupuncture procedure. “Though I shouted out, none came to my rescue. Just then a child in the house started screaming, which made the couple to abandon me”, she explained. “I shouted, and then I was taken to hospital, where I was told that there were needles all over my body”, she said. Letchumi said that the household comprised the couple, their four children and the madam’s mother, who looked after the children. She had been well received during her first month. Trouble arose at the end of the first month when her salary was due. It hadn’t been sent to her bank account even after three months. It was on August 23 that she refused to work anymore till her salary was paid. At the hospital, she learnt that she was to be sent back. In the meantime, her hands and legs were swollen. Even at the agency, while awaiting transit, she had been refused any medication. A Lankan friend had helped her to make her return possible. She returned on October 7 sans any money. She had told no official at the Bandaranaike International Airport of her plight, but returned to Kurunegala by bus, with Rs 200 she had saved. Police Inspector Vitharana of the Gokarella police had intimated her case to the Foreign Employment Bureau (FEB), who in turn had instructed the divisional office to get her admitted to Kurunegala hospital for an operation. She was operated on by Drs P.R. Suraweera and Mohamad Seyid of the Kurunegala Teaching hospital. Commenting on the surgery done on two days, Dr. Suraweera said that, she had injuries to her hands and feet which were x-rayed. It revealed that she had nine needles in her left hand and four in her right, with another in her left foot. The first operation had lasted one hour and the second about half that time. According to Senior Superintendent of Police Vas Gunawardene, the job agent in Kurunegala had warned Letchumi and her husband against complaining to either the police or the FEB, as he would lose customers, if this case was revealed. Police had warned the job agent on this. Meanwhile, her husband Rengasamy said that the agent had asked him for Rs 1½ lakhs to bring her back. This was denied by the chairman of the association representing the agencies. He said he was unaware of her plight in Kuwait, as she had only said that she was sick. He added that he had spent money to bring her down. 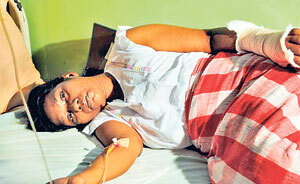 Chairman- FEB, Ranawaka said that they had admitted her to hospital after learning her story. He added that they acted only on genuine complaints, as otherwise, it was not good for our country to act on flimsy reasons. He said that, on receipt of more medical evidence, they would act further after receiving advice from the Attorney General. He concluded that he would do his utmost to avoid repetitions of such incidents in the future. It was Ariyawathi of Matara who was a similar victim three months back.